We’ve all heard the adage “look both ways before you cross the street” from the time we were children. We heard it from our parents and teachers and it used to be that was enough but, recent studies are showing more teenagers and young adults being distracted by electronic devices in and around areas of high pedestrian traffic including crosswalks throughout the United States. In fact, according to a recent story by CBS News based upon National Highway Traffic Safety Administration (NHTSA), the incidents of children, middle schoolers and high school students being distracted by headphones, smartphones, and the like is at an alarming rate. (See story here). According to 2011 statistics, there were approximately 69,000 pedestrian incidents involving injury in the U.S. last year 4,400 of these pedestrian mishaps resulted in a death and 11,000 of these persons injured or killed were under the age of 14. Based upon a recent NHTSA observation study, teens are the most likely to be using electronic devices while walking to or near schools. In fact up to 40 percent were observed both wearing headphones and texting at the same time. Likewise, kids were observed either listening to music or playing video games on gaming devices about 40 percent of the time as well as pedestrians traversing to and from school. Why is “distracted walking” particularly dangerous around crosswalks and intersections with lighted signals? Many studies have shown that pedestrians feel somehow “insulated” while crossing an intersection within a crosswalk. They step out into the painted lines as if there is an invisible force field surrounding the area. Oftentimes, when distracted, they fail to observe whether the pedestrian walk signal or red or green circular traffic lights have yet changed to indicate the ability to cross the roadway. Likewise, drivers rely heavily upon light signal changes and don’t observe pedestrians stepping out into the intersection or trying to “rush” to finish crossing the street as the lights are changing. This makes it particularly dangerous for both vehicle operators and walkers to add the use of electronic devices to an already dangerous situation where attentiveness is key to safety. What does the California Vehicle Code say about “looking both ways before you cross the street”? Luckily for pedestrians, California Vehicle Code §21950(a) and (c) requires a driver of a motor vehicle to yield the right of way to all pedestrians within a marked crosswalk or unmarked crosswalk and to use “due caution” and reduce speed accordingly. HOWEVER, California Vehicle Code §21950(b) states: “This section does not relieve a pedestrian from the duty of using due care for his or her safety. No pedestrian may suddenly leave a curb or other place of safety and walk or run into the path of a vehicle that is so close as to constitute an immediate hazard.” This applies to all Californians across the board. It provides a legal standard and duty for the young and old alike. What is the conclusion to be drawn about the rights and responsibilities of our children and young adults while walking on our public streets? 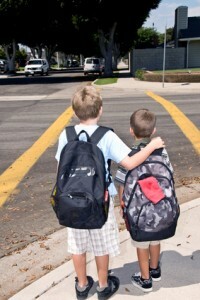 The bottom line is that we all have a responsibility to teach our children and teens about the importance of safety while walking especially in and around schools but, regardless of where they are. The problem is especially acute in urban areas like Los Angeles where high vehicle traffic and large intersections compound the dangers. We as parents, teachers, and adults with influence over our kids and teens need to stress the importance of not just “looking both ways before you cross the street” but. being fully aware of our surroundings at all times when traveling on foot around motor vehicles. Just like stressing that texts and other electronic communications can “wait” while driving, we need to stress that “it can wait” while walking too! Click here for further information or assistance with any pedestrian accident or injury claim in Los Angeles or anywhere in California.